I was honored last spring when Joel Ralph, Manager of Education and Outreach Programs for Canada's National History Society of asked me to write an article for a special education issue of Canada's History Magazine : The Beaver to be published this fall. The issue is now available and in addition to the print copy you can also view the entire magazine online as an interactive publication, complete with active links. I have embedded a copy of the online interactive magazine in this blog post. You can also view the online edition by using this link (starts on page 30). If you speak French you can also view the entire issue in French here, which I think is pretty cool even though I don't understand any French. It was a pleasure working with Joel and the staff in Canada and I thank them for asking me to write for their publication. I encourage you check out the education issue with lots of great ideas for connecting with history students in the classroom. I also encourage you to check out Joel's blog : The New Digital History Education. View more presentations from elanghorst. Friday I'm spending some time with the staff at Wright City, Missouri to discuss the use of technology in the classroom. I'm providing a morning session on podcasting and editing audio, at lunch I'm giving a short presentation entitled "Does Technology Really Make You A Better Teacher?" and in the afternoon my session is on the power of collaboration and a variety of web 2.0 tools which can help teachers in the classroom. I'm excited and looking forward to a great day of discussing and sharing ideas about technology in the classroom. Last year I started a group at South Valley Jr. High called the "History Geeks". It is an extracurricular group to provide students opportunities to explore historical topics - a field trip to a historic site, a book club which reads an historical book and providing historically themed speakers. During the school year we try to have one historic speaker a month. Last week we started our historical speaker programs with Cheryl Harness sharing her experience as an author, historian and illustrator. Cheryl is an incredible artist how also writes historical biographies. Her work is well known nationally and associated with National Geographic. Our students enjoyed listening to Cheryl discuss her start in art and how she researches her books. The podcast today is the audio from Cheryl's presentation and is about 50 minutes in length. Be sure to check out Cheryl's site and one of her recent books, a graphic novel about the life of Harry Truman : "The Harry Book - A Life of President Truman in Words and Pictures" . You can check out more books from Cheryl Harness here. If you have any thoughts you'd like to share please leave a comment on this blog. Thanks. Yesterday the family went out to Watkins Mill State Park in Lawson, Missouri to attend their annual Fall on the Farm Day. Watkins Mill is a great place to learn about Civil War era Missouri. Each year they host a day in fall with living history exhibitions to demonstrate life on a farm in this era. I brought along my Flip camera and took some video which I have shared with this blog post. I have included videos on sheep shearing and a blacksmith. It was a great day and I look forward to attending a similar event in the spring when they host Spring on the Farm. Hello. Today's podcast is an update from Speaking of History Podcast #197 when I asked for suggestions on teaching the Constitutional Convention with each student representing a delegate in Philadelphia. I received some great suggestions - check out the comments from podcast #197 - and several of them pointed me in the same direction : the History Alive! United States History curriculum. I remembered receiving a History Alive! curriculum kit a couple of years ago from a representative at a conference and am very excited about using it in my classroom in a couple of months when we cover the Constitutional Convention. 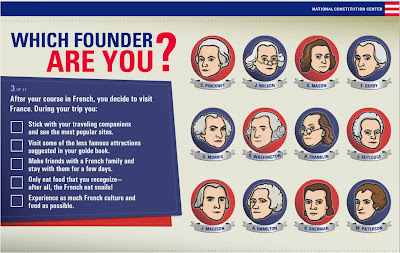 Another great idea came from Lance who suggested that my students try out the quiz from the National Constitution Center which matches you with one of the Founding Fathers based on your answers. Very cool and something I plan to do with my students during our Constitution unit. Thanks for all the suggestions and e-mails. It is amazing that you can throw a question out there and so many people are willing to respond and contribute to the conversation. If you have any comments for this blog post - maybe you currently use the History Alive! curriculum - please leave a comment on this blog post.